Blizzard has done a great job of adding to the very large roster of tameable pets. Several times during expansions, we will see yet another family becoming available for use. If you're a Beast Mastery hunter, you have 10 more families from which to choose a pet. In the Beast Mastery "exotic" roster are the two headed Core Hounds. I have a couple, the red named core hound from Upper Blackrock Spire, and the named purple core hound from Blackwing Lair. Shown above is a void terror. This particular one prowls the Sunwell Plateau raid. These are considered part of the core hound family, but aren't tameable. 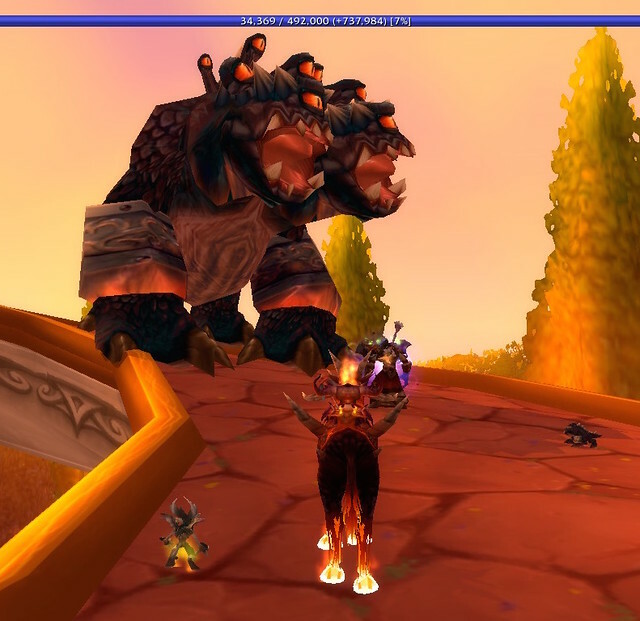 Every time we come into Sunwell, we hunters think just how cool it would be to have one as our hunter pet. One of the problems with this particular family is that these aren't technically hounds. They are demons. It would not be out of character for a hunter to tame one of these. We do have, within the dog family, demon dogs and runed demon dogs, both of which can be tamed. I remember when the runed demon dogs were allowed to be tamed. I rushed out and got a blue one. They have a neat look. They are usually found with warlock mobs although they are not part of the demons warlocks can summon as pets. So there is precedent for allowing hunters to tame demons. But if it would be out of character for hunters to use the void terrors as pets, why not add them to the warlock's stable? To the right in the photo above, you'll see a small void terror battle pet which was added to Sunwell in Patch 6.1. Everyone has the opportunity to get that. I can see not allowing hunters to tap into the shadow realm to summon a void terror but it would be awesome to have my gnome warlock summoning something 6 times her size. I'd even do a quest chain to be allowed to summon it.